As a fan of classic gaming, I found Tobe's Vertical Adventures to be charming the first time I fired it up. 16-bit style indie games are everywhere, but this one veers more towards innovation than purely nostalgic retread. As you'd expect from the title, the scrolling action takes place vertically, not horizontally. This quality is very rare in a game, reminiscent of Ice Climbers or the original Mario Bros. (No, not Super Mario Bros., the arcade predecessor.) Tobe himself has a variety of moves that would make Sonic or the angelic Pit proud. The game looks, and to a lesser extent, feels like a game that could have been created in 1992, and I mean that in a good way. The significant twist to the gameplay is the dual nature of each level. 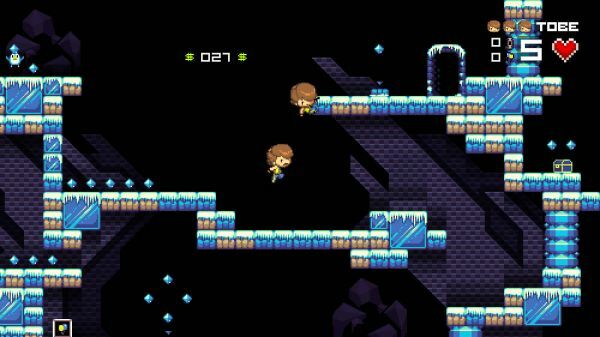 As you begin, Tobe makes his way down, ever deeper, collecting gems and avoiding bad guys all the way. The ultimate goal is to recover the treasure at the bottom of the level. Once this is done, spikes rise from the floor and Tobe has only a limited amount of time to escape. It's as if the whole game is based on the similar conceit from early on in Super Metroid. The tension does ramp the difficulty up considerably, but not to the point of frustration. Co-op is supported in Tobe's Vertical Adventure, but it was a bit difficult to get up and running the first time. The PC version assumes you are using keyboard controls by default. While swapping to a controller for player one was simple enough, doing so for player two was not. Additionally, we were unable to pull off all of the moves using just the keyboard, blocking our progress together significantly. It's a flaw in an otherwise solid game, and while it's not deal breaking, fans of co-op might want to stick with the Xbox 360 Indie version. In any event, I found Tobe's Vertical Adventure to be a standout of the retro-style platform genre, definitely a worthy addition to any classic gaming fan's library. Page created in 1.1801 seconds.